The kids were clamoring for a new pet. A year earlier we’d said goodbye to our dog, and before that, the cat. In between was an unsuccessful series of hermit crabs. When each one crossed that proverbial rainbow bridge in the sand, we’d stood around its tiny hole in the ground and offered a tearful remembrance for little guy who never ever pinched, well, almost never. The kids now wanted a dog, only I wasn’t up for it. I didn’t feel like going back down the pet road. I kind of didn’t want to go down the anything road. We had five children aged 2-10, and we’d had a few losses in addition to pets that left me feeling less than resilient. So I said no when my husband and kids wanted a giant Leonberger puppy. I said no to the rescue rabbit and chinchilla, no to the turtle, please no to the Christmas hamster. How about fish? My husband was surprised: So, we’re not going to have pets anymore? But you were the one who raised all those crazy animals as a kid. There’s a scene in my novel in which a woman sees her children touching baby rabbits in the bushes, and freezes in panic. On the island where they are vacationing there’d once been an outbreak of tularemia (http://www NULL.cdc NULL.gov/tularemia/), a sometimes-lethal disease carried by rabbits. And though my main character isn’t ordinarily paranoid, it’s the summer following the September 11th attacks, and she’s becoming unhinged in a million small ways. Writing this fear hadn’t come naturally to me, because I spent much of my childhood loving and raising wild baby animals. 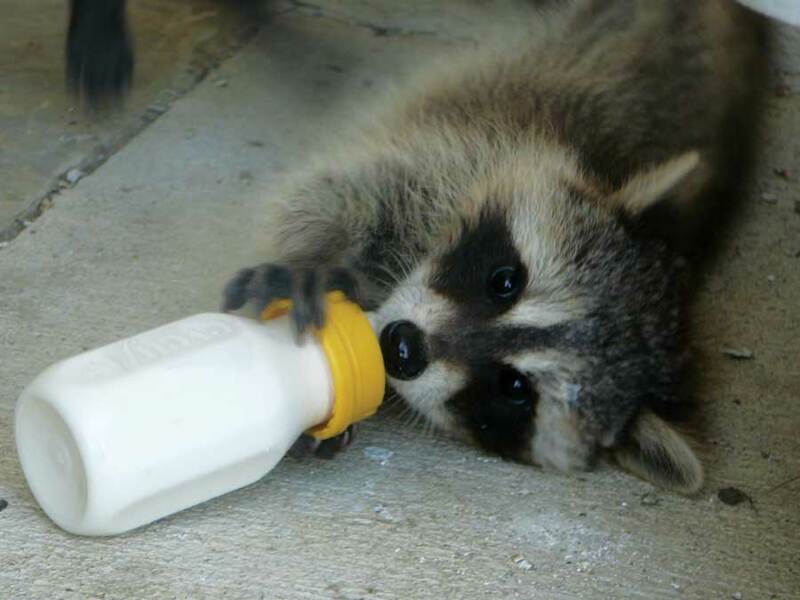 Each spring, the wildlife rescue hospital where I volunteered would be inundated with orphaned and injured raccoons and squirrels. Junior staffers would bring them home to bottle feed them, wean them on fruit and dog food and, if we were lucky, keep them alive to be released in a park upstate. It was a formative experience, maybe the most significant one of my teen years. But I’m not sure how I’d feel if one of my children wanted to do something like that, themselves. This occurred to me recently when my kids were aflutter over a baby bird we found on our driveway, so young it was still mostly bald, and we were trying to find something to do for it. 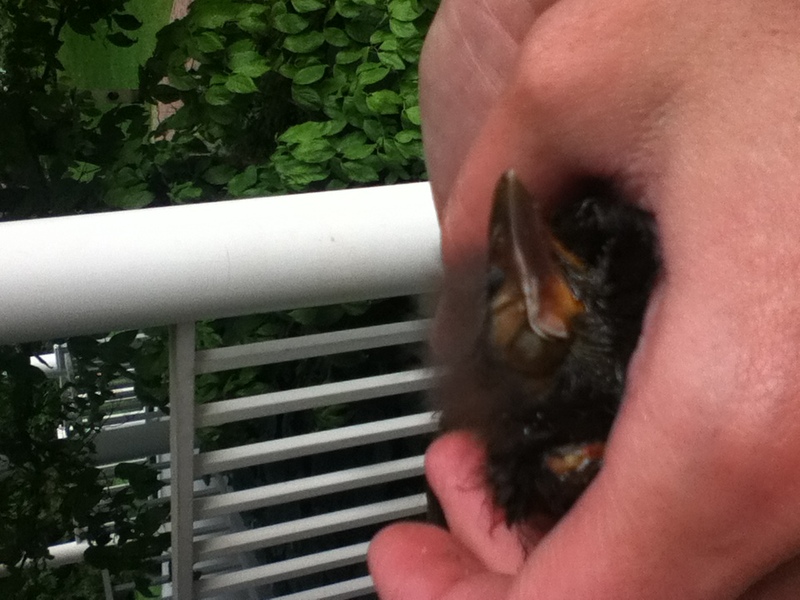 I cupped it up gingerly while the kids dug up a syringe of water, a nest of grass, a worm. A neighbor came outside, visibly stunned to see us doing this. What about avian flu? She asked. I didn’t know. What about avian flu? 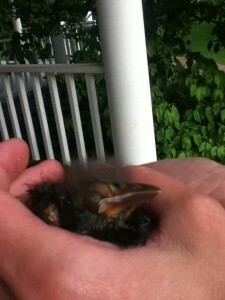 After we did what we could for the bird, I made the kids wash up like Lady MacBeth. I don’t have a medical bone in my body beyond the fact that, well, I have bones in my body. I don’t know if various animal and insect-borne diseases are on the rise, or if it just feels that way. But I do know a few things about anxious things: namely, that in the space between knowledge and confusion, paranoia blooms. When bovine spongiform encephalopathy (Mad Cow disease) was discovered in beef several years back, I was all too aware that this disease could lurk in any hamburger, could have migrated from the fields of Britain to Canada and the ranches stateside. For the better part of a year I wouldn’t buy beef for the kids unless, I decided, it was from one of those Canyon Ranchish ranches, the sort that fed their cattle hothouse-sprouted organic grass from fields sprinkled with pixie dust. I don’t mean to be flippant about the disease, which is terrible — just about my knowledge and obsession, which were tiny and huge, respectively. Once I got it into my head that this was a potential area of danger for my family, I couldn’t ignore it. I’m not a germophobe, and I’ve always had a pretty high threshold for what I do not know and cannot control. But a little knowledge and a little control — well, that’s a dangerous thing. It suggests action is called for. I could have thrown myself into research: the exact fields identified to be infected with BSE and any Americans ever to have set foot there; the best retail outlets for the Canyon Ranchesque beef. But as a busy mother trying to triage her mental energy, I opted for the safe way out: I just said no. OF MY BABY raccoons and squirrels, only half ever survived, maybe less. I had the worst success rate of the junior staffers because I took the hopeless cases. The babies with a wobbling not-rightness caused by some disease or other, and the ones brought in after dog attacks, their backs split open and writhing with the sorts of things that don’t belong there. I triumphed over the ones that did make it, each raccoon-puppy that ran from the crate toward the woods to (in my mind) the swelling strains of “Born Free.” But each time I’d come home from school and find a furry body lifeless and cool, I’d cry my heart out. Then I’d go out back to the woods behind our house with a large shovel, adding to my sad collection of small animal graves. Someday anthropologists are going to wonder what odd cult flourished in our leafy Connecticut suburb. In hindsight, I’m surprised my parents agreed to let me do it. Certainly it was a learning experience, even if a tough one. There was teetery organic lesson to be had from each attempt and failure, each foster relationship with its decent odds of heartbreak, and though I didn’t think of it that way, my mother likely did. An acceptance of the cycle of life and the small part we play in it. Loving what’s before us right now needing help, doing the best we can in the moment. Saying yes to something that needs help and taking the risky emotional investment instead of taking the safe way out, with No. 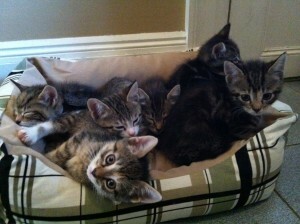 Last summer, a high school friend who works in animal rescue in Brooklyn posted a facebook message: SIX PREEMIE KITTENS! HEALTHY BUT BEING KILLED TMRW ONLY BECAUSE THEY’RE TOO YOUNG TO BE ADOPTED! FOSTER FAMILY NEEDED FOR 3 WKS! 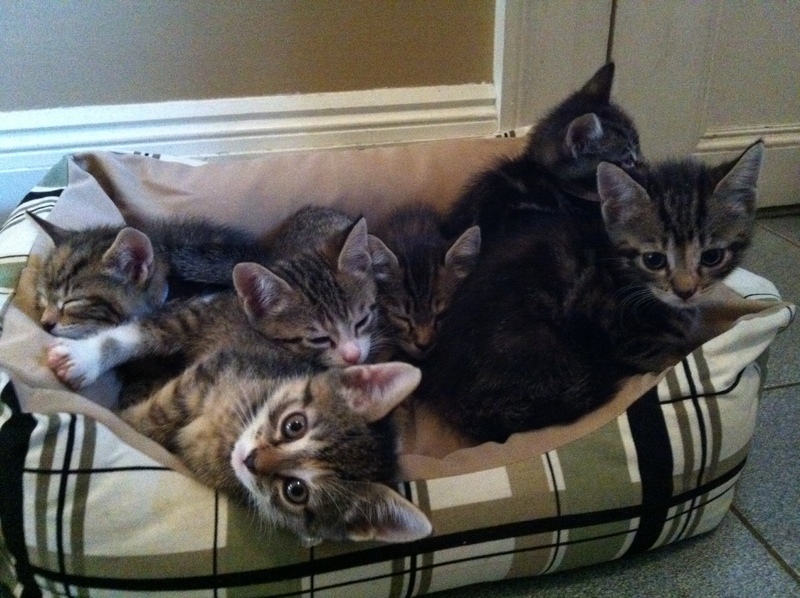 Each hapless tiger-tabby baby had its own mug shot. I still didn’t feel ready for pets, much less high risk ones, but the kids were apoplectic with desire. I told them about the hard work. The syringes of formula and the eyedroppers of medicine, and the stinky whelping box our mudroom would become. I told them that sometimes babies don’t make it. They made a sign for the car window for a drive Brooklyn, “The Great Kitten Rescue!” And I said yes. When I was editing my manuscript for the umpteenth and final time, going back over those scenes of the mother with rabbit anxiety for emotional truth, I asked my own mother why she let me do it. Why she let me raise all those baby animals that might or might not have had rabies, or ebola virus, or might have left me emotionally paralyzed by the young intensity of nurturing and loss. It’s what you did; it was your thing, she said. All I had to do was say yes. This entry was posted in On Faith, Hope & Love, On Learning, On Parenting, Wild Kingdom and tagged animal rescue, baby bird, baby raccoon, baby squirrel, Nichole Bernier, orphaned baby animals, rescue kitten, The Unfinished Work of Elizabeth D. Bookmark the permalink. Recently while at the Vet with my dog, a young girl rang the bell. As the receptionist made her way to the door she said “oh no, here we go”. I couldn’t imagine what was coming in the door. This girl had a shoebox in her hand (something I couldn’t see but the receptionist had) and inside were a few baby squirrels that she and her mother had found on the ground that morning. They were dutifully taken to the back for the Vet to check out. Then, the girl’s mother was asked to sign a form which made the squirrels the property of the Vet. I can only imagine what became of them. It’s always a difficult decision what to do. Probably the best decision would be to just let nature take it’s course.